How do I change the colors used in MS Word 2007 track changes? I'm reviewing a document in MS Word 2007, and when I add comments, the bubble has red text on a slightly lighter red background. This is pretty hard to read. The Track Changes Options dialog isn't of much help, I can change the background color for Comments, and it's slightly more readable. But I know that Word assigns a color to each user who reviews the document, I'd like to be able to change mine to a different one, and still have it work properly when I pass the document on to others. You just go to 'Change Tracking Options', and choose your color. There isn't a large variety, but it's better than red. Insertions are marked in red with underlining, deletions are marked in red with strikethrough, while moved text is marked in green with double strikethrough and underlining. Word also places a vertical line in the margin next to any changed lines. The vertical lines and other revision marks may be printed. On the Review tab, in the Tracking group, click the bottom half of the Track Changes tool and select Change Tracking Options. The Track Changes Options window opens. If you prefer that all of your edits be in one color, such as red, you can uncheck the Track moves checkbox in the Moves area so that the green formatting is turned off and all of your changes will be in red. Later you will see that Word assigns a different color to each reviewer of the document. From here (pdf link), on page 9. It's very useful! In Microsoft Word 2003 (! ), go to Tools, Options and choose the Track Changes tab. In there you can change the colours of the various changes. Hope that helps. Not the answer you're looking for? Browse other questions tagged microsoft-office microsoft-word-2007 or ask your own question. How to change the name of a reviewer in Word? Word Document (2007) missing pages? How to hide heading 1 numbering in ms word 2007? 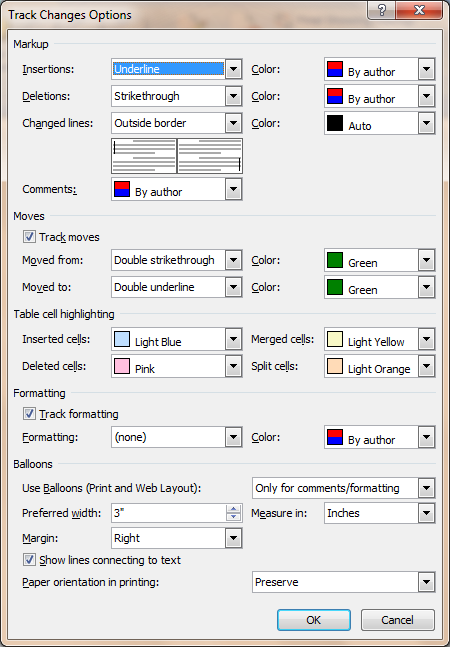 Lost in MSWord 2007 - How do I add Reviewers & change colors?